NASHVILLE — Pekke Rinne and Viktor Arvidsson gave Nashville more of the same Thursday night. A little extra from newcomer Brian Boyle helped make the difference. "I thought it was a pretty entertaining game going both ways," Price said. "I thought we held our own for sure. We don't like the result, but I thought we played a good team well." "We've got an active 'D,' so you've got to be able to cover," Boyle said. "I had some probably higher quality chances earlier, but whatever, I'm excited to win. It's a really good feeling. It's great to do it at home, too." "It was a long time, longest streak I've ever had at any level, so it was a good feeling," Ryan Hartman said. 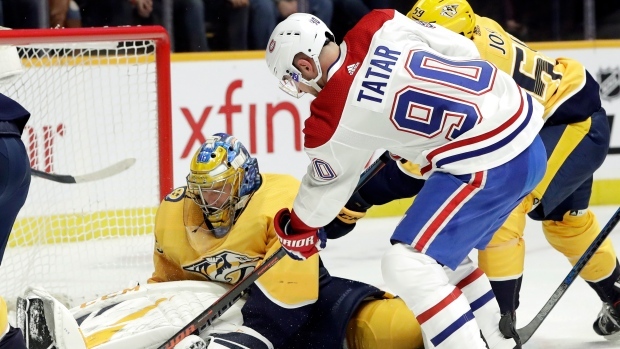 "Our first period made it look like we hadn't played in four or five days," Montreal coach Claude Julien said. "We weren't very good. In the second period, we seemed to get our legs going. We seemed to find our game, but we didn't capitalize on our chances. We had lots of them and that's what probably hurt us in the end."